How do musicians know what they know? This study is a new approach to the nature of musical competence. Using the intricate collaborative structure of gamelan—Javanese ensemble music—as a point of departure, Knowing Music, Making Music lays the foundation for a comprehensive theory of musical competence and interaction. 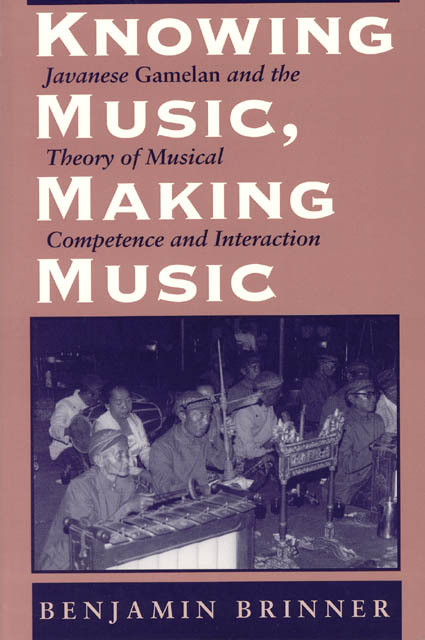 Using illustrative examples from a variety of traditions, Benjamin Brinner first examines the elements and characteristics of musical competence, the different kinds of competence in a musical community, the development of multiple competences, and the acquisition and transformation of competence through time. He then shows how these factors come into play in musical interaction, establishing four intersecting theoretical perspectives based on ensemble roles, systems of communication, sound structures, and individual motivations. These perspectives are applied to the dynamics of gamelan performance to explain the social, musical, and contextual factors that affect the negotiation of consensus in musical interaction. The discussion ranges from sociocultural norms of interpersonal conduct to links between music, dance, theater, and ritual, and from issues of authority and deference to musicians’ self-perceptions and mutual assessments. Much more than a portrait of artists making music together, this book brings together a variety of cognitive approaches and a wide range of examples from many cultures to suggest ways of integrating our knowledge of music making both in individual cultures and crossculturally.